Flexpak manufactures siding covers for protection during the post-production and shipping environments. 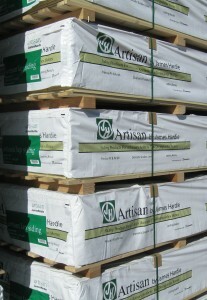 Siding covers provide a cost effective solution to packaging pallets of siding for shipment to the consumer. Siding covers can be manufactured in the styles of Sewn Pallet Covers or with the V Style Pallet Covers manufactured on a roll. Both styles of covers provide protection from moisture and resistant tears. The protection provided by plastic allows for resistance to forklift scuffs or other product abrasion. While there is certain flexibility with siding stacks, covers are designed to allow such flexibility in forklift transport while maintaining the integrity of the cover. The custom sizing options at Flexpak allow for a cover manufactured to meet a specific sizing requirement. Contact Flexpak at any point to discuss creative packaging solutions today.